How do I register to use the food bank? Click here. 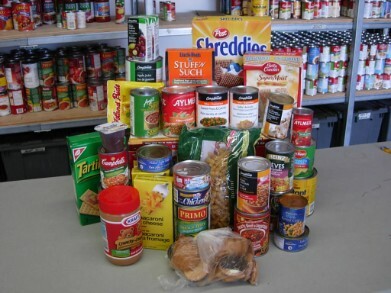 If you are planning a food drive for this Easter, please remember to plan for delivery to the food bank. Larger donations can be dropped off at our site Parkway Storage, 1535 Pickering Parkway. Monday–Friday 8 a.m. to 8:30 p.m. Weekends 9 a.m. to 4:30 p.m.
Buzz at the main gates for entry. Visit our CURRENT NEEDS page for food items we really need. Thank you for remembering your local food bank. Have you lost a set of important keys? They showed up in a donation bag recently. Contact us by phone or email to retrieve them. The food bank is now operating in an area of approximately 3100 square feet providing our volunteers with a safe work environment and permitting all food donations to be stored under one roof. This meant knocking down walls, adding insulation and drywall plus extending heating and air conditioning. We were also able to build a new office for our clients to have privacy when registering with us or discussing their personal issues. The renovations could not have been done without the cooperation of a great many people including the City of Pickering, Coughlan Properties and help from our many volunteers. Your financial support over the years has enabled us to complete this much needed work in order to meet the growing needs of our community. Thank you. Seldom do we have the opportunity to know how the food bank affects the lives of the people we serve but we recently received a heart warming story from a former client who recalls attending the food bank with his mother. You can read his story here. Mailing address: 882 Kingston Rd. Pickering, ON L1V 1A8 Attn: Food Bank. We also accept grocery store gift cards and online donations through PayPal. Thank you for supporting your local food bank. You can make a financial donation online via PayPal here. Are You Planning A Food Drive? If so, please don't forget to include donation delivery in your plans. We have very limited ability to pick up large accumulations of donated food. We have no paid staff and no vehicles other than those operated by our volunteers. Donated food may be dropped off at Parkway Storage Units, preferably during food bank operating hours. To arrange delivery at other times, please contact us. What do you think of when you hear the word FOOD DRIVE? If you are like most people you would answer - non-perishable items like soup, canned vegetables, tuna, canned spaghetti, baked beans dry pasta and of course, Kraft Dinner. All of these items are important to us and we appreciate receiving them. However, there are other food items just as important but we never have enough: breakfast cereal, tea bags, instant coffee, sugar, cookies, crackers, luncheon snacks, dessert mixes (i.e. muffin mix/brownie mix) dry soup mix, condiments, toilet paper and personal hygiene products. Statistics show that children learn better and behave better in school if they are not hungry. On average, we serve 60 families each week so we are always in need of breakfast and lunch foods and snacks. The next time you are thinking of donating to our food bank, please visit the Current Needs page.for suggested items or contact us via email. Established in 1991 as a temporary outreach program by some members of St. Paul's on-the-Hill Anglican Church, the food bank has outgrown several locations. Unfortunately, the need has not diminished over the years but the base has broadened. We now draw volunteers from across the local community. Over thirty individuals regularly donate their time and efforts to keep the food bank operating. We are also generously supported by many individuals, businesses and organizations. Without the strong support of the community we could not continue to operate. 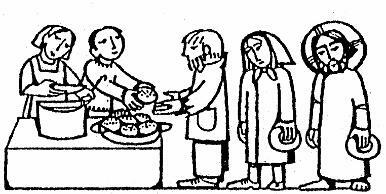 The food bank is open to clients on Tuesday and Friday mornings from 10 AM - 12 Noon. We depend on the generosity of community members who support our mission and vision. You can help too by contributing food or making a donation. Because food collection is uncoordinated, we often end up with too much of one item and not enough of another. You can help us stock our shelves based on current need. Please check our Current Needs page for the foods in short supply.